Last night, Ed, his dad, and I went to a Christmas concert at Temple Square. It was the first Christmas concert of the season, and fitting, since this weekend is the first weekend of Advent (and therefore the start of the Catholic liturgical year). Before the concert began - because we had arrived in plenty of time - we took a few minutes to walk around Temple Square to admire all the Christmas lights, which had only been turned on the day before. It was a fairly warm night for late November - no heavy coats needed. Unlike previous years, I didn't go mad taking pictures, but I did take two. The lights are really arranged quite well; everything is beautifully decorated. 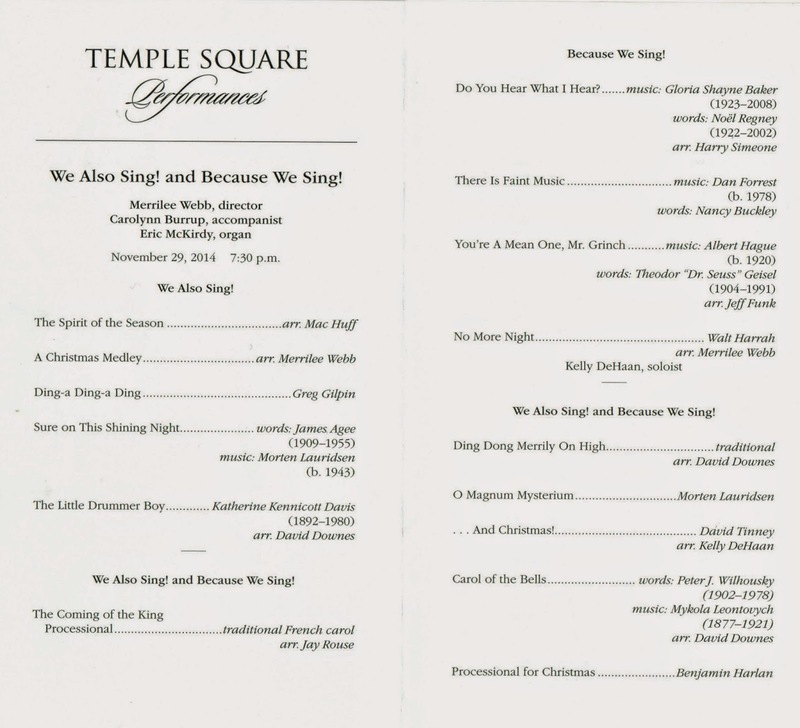 Two choirs performed - Because We Sing! and We Also Sing! The concert lasted about an hour, with both choirs performing separately and together.